Thousands of years ago there was an eruption at Humu'ula Saddle, the broad wide pass between Mauna Loa and Mauna Kea on the Big Island of Hawai'i. The eruption was mildly explosive, so the resulting landform took shape as a cinder cone. At the time, it was a barren peak amidst a forest of native Koa trees. As time went on, soils developed on the cinder cone, and the forest expanded to cover the hill. Much later the situation was reversed because extensive sheets of basalt flowed from Mauna Loa, most recently in 1843 and 1935. 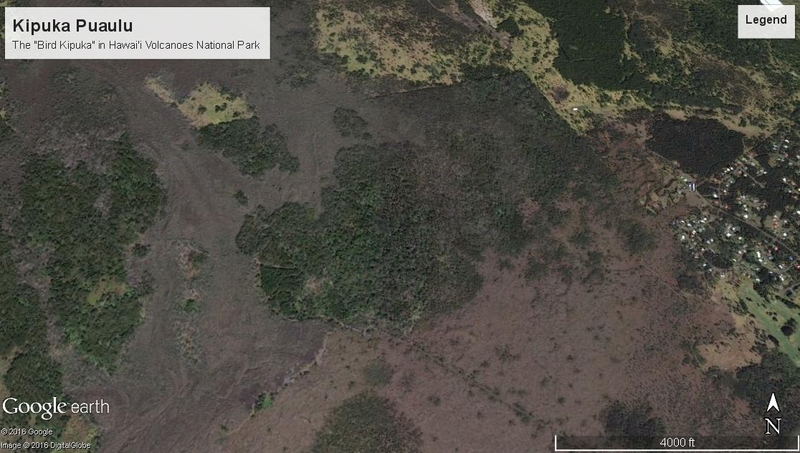 They covered the entire saddle area and decimated the Koa forest. Except for the lone cinder cone. A small remnant of the ancient forest survived. 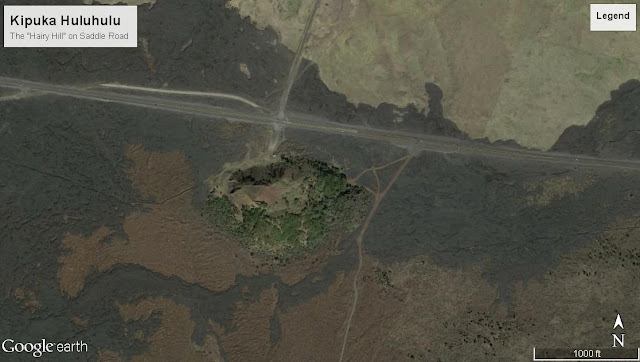 The hill, called Pu'u Huluhulu ("hairy" or "furry" hill) is a stark example of a kipuka, an island of sorts in the middle of lava flows that preserves a portion of the original pre-flow surface and the plants and animals that lived there. The Google image above shows just how isolated the cinder cone is. If you are looking for the "Hawai'i That Was", a kipuka is a good place to start. They are like museums of what once was, but they are far more than that. In preserving the flora and fauna, they provide the genetic material that will eventually repopulate the areas of devastation. Edge of Pu'u Huluhulu, where plants start to recolonize the lava flows. There are hundreds of kipukas spread across the Big Island on Mauna Loa and Kilauea. We explored two of them on our recent exploration of the islands: Pu'u Huluhulu at Saddle Road, and Kipuka Puaulu in Hawai'i Volcanoes National Park. Because it is a hill at the boundary between Hawaii's two largest volcanoes, Pu'u Huluhulu offers dramatic views. It is also a bit schizophrenic: it is composed of cinders from the "plumbing" system of Mauna Kea, but was later intruded by dikes of basalt from Mauna Loa. The forest of Pu'u Huluhulu may have escaped the destruction of lava flows, but it has not escaped alteration by humans. The northwest flank was quarried for cinders in the past, and is still barren on that side (although geologists appreciate the exposure of dikes and cinder layers). Cattle, goats and sheep have grazed the hill at various times, although a fence now keeps them out (as long as hikers close the gates). Several short trails, though steep and rocky in a few spots, provide access to much of the kipuka, and the site is recognized as a hot spot for viewing rare native birds. Kipuka Puaulu, the "Bird Kipuka", at Hawai'i Volcanoes National Park (forested area in center of picture). At Kipuka Puaulu (or Kipukapuaulu) in Hawaiian Volcanoes National Park the situation is a bit different. For one, it is about ten times larger than Pu'u Huluhulu, covering about a square mile. It's also more of a depression than a hill. About 600 years ago, a lava flow from Mauna Loa overwhelmed the forest of mature Koa and Ohi'a trees, but left a fragment of the woodland sitting on 8,600 year old lava unscathed. Over the years the kipuka was occasionally mantled with ash from the eruptions of nearby Kilauea, but the forest persisted, in part because the ash produced thick moist soils. Today, the kipuka contains one of the most diverse collections of native flora on the Big Island. A beautiful and serene one-mile trail winds through the unique preserve. A Hawaiian elder calls it a "Residence of Godly Existences". It wouldn't be quite correct to describe Kipukapuaulu as an untouched pristine environment. Cattle were released on the islands in the late 1700's, and pigs and goats moved in as well. 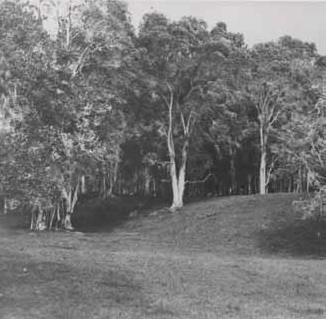 The natural flora of the kipuka had no defenses against the aggressive grazers, and by the early 1900's, the kipuka was a park-like grassland shaded only by the "grandfather trees", the older Koa and Ohi'a trees that the cattle couldn't reach. A park sounds pleasant enough, but the trees couldn't reproduce (the saplings were quickly eaten), and the diverse understory of shrubs and perennials had been replaced by alien grasses (below). 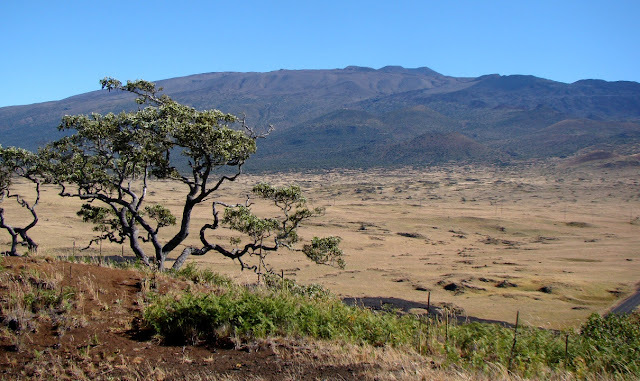 The potential value of the kipuka as a preserve of rare native species was recognized surprisingly early by botanists, who arranged for the removal of cattle in 1928, and the removal of goats and pigs by 1968 (a fence surrounds the kipuka). Volunteers removed the worst of the invasive weeds and grasses, and seeds of native plants lying dormant in the soils started sprouting. In other cases the native species were planted by hand. 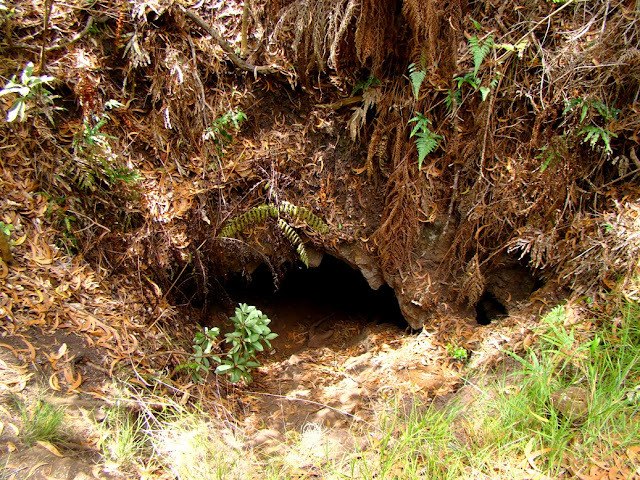 After a few decades, the kipuka is returning to a condition that is at least comparable to its natural primeval state. Have you ever wondered about the identity of the rarest plant in the world? We recently had a story about a single plant of Franciscan Manzanita in San Francisco, discovered at an intersection that was being repaved. How about a plant with no living shoots or branches? One of the strangest stories I've run across regarding Kipukapuaulu is that of the small Hibiscus tree called Hau Kuahiwi (Hibiscadelphus giffardianus). A botanist named Joseph Rock (with that name he should have been a geologist) discovered the sole remaining specimen of the plant on planet Earth in Kipukapuaulu in 1911 (the cows had not quite finished it off). The one plant died in 1930, but a local resident managed to collect enough seeds to get a few sprouts going, and so the plant survives in captivity, so to speak. Around 200 have been planted in the kipuka that was its ancestral home (as well as the adjacent kipuka, for insurance from possible future lava flows). The kipuka came under protection pretty much in the nick of time. Some of the "grandfather trees" that shade the preserve have been dying off in recent years (like the trees in the picture above). On species, the Ohi'a tree (Metrosideros polymorpha) is one of the most extraordinary of the native trees in Hawai'i. The Ohi'a thrives in a greater range of environments than pretty much any tree on the planet, being found in places as diverse as new lava flows, desert slopes, and alpine ridges. They can appear as small shrubs or as huge rainforest canopy trees nearly a hundred feet tall. The Ohi'a trees in the kipuka are dying, perhaps of old age, a newly spreading fungal disease, or because of a series of droughts in recent years (maybe all three). With the diversity of plants now in place, one would hope the kipuka would be able to adapt to the loss of the old trees. The preponderance of native plant species attracts the native bird species to the kipuka, and they can commonly be seen flitting about in the forest canopy. They thrive here for two reasons: at 4,000 feet, they are above the mosquito zone, so are protected from transmitted diseases, and mongooses have not crossed the barren lava flows to prey on the birds. They are frustratingly difficult to photograph, and I am actually cheating here by showing a picture of an Apapane from nearby at the park visitor center. The bird below is often seen in Kipukapuaulu, but it is not actually a native. It is a Kalij Pheasant, a 1962 import from southern Asia. There is some concern about the effects they might be having on the vegetation. To the average visitor the islands, the kipukas are a little-known aspect of Hawaiian geology and biology, but they are an important link to the past, and an important repository of the island's genetic history. If you ever visit, set aside some time for an exploration. View from the forest on Pu'u Huluhulu towards extensive Mauna Loa lava flows. 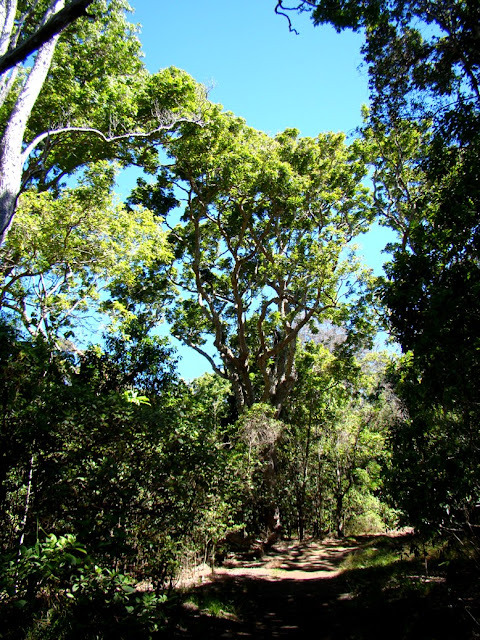 Much of my information in this post is drawn from the Kipukapuaulu Trail Guide, written by Tim Tunison and Andrea Kaawaloa-Okita, and published by the Hawai'i Natural History Association. Additional information was gleaned from the book Hawai'is Native Plants by Dr. Bruce Bohm. Such amazing old oases of original flora and fauna... This is fascinating, Garry, I was not aware of the isolation caused by the lava flows. Thanks for the explanations and the photos as well. Cheers.